Thanksgiving is almost here and when you are a vegan or vegetarian or just someone looking to not end up in a food coma after arguably the largest meal of the year, your options are slim. You all have given so much love to my recipe for Quinoa stuffed Sweet Potatoes that I have done in years past (we just reached over 200,000 pins on pinterest! Check out my page for loads more Thanksgiving inspiration!) I thought I would give you an updated version 🙂 This dish is perfect to make ahead and bake the day of. It can easily replace the turkey as your “main” dish or it makes a great side dish that everyone will love. This dish is vegan, vegetarian, gluten free, lactose free, easily made nut free, cholesterol free, trans fat free, high in protein and SUPER delicious! Side note: how pretty is that new sustainable wood serving dish? I got it on Pacific Merchants! I hope you enjoy! In a large frying pan, sauté the onion, thyme, and cranberries until the onions begin to soften, 3 minutes. Add in the apple, walnuts, and kale. Cook until kale begins to wilt. Add in the garbanzo beans and quinoa. Give it a good mix and let cook together for about 5 minutes. 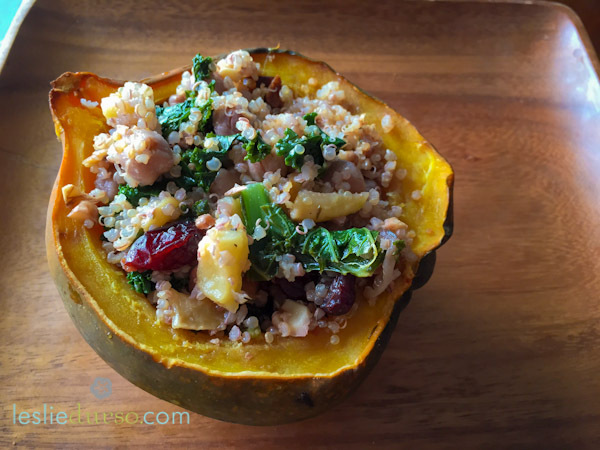 Spoon your quinoa mixture into the wholes in your acorn squash. Place the squash in a backing dish lined with foil. Repeat with the remaining quinoa and squash. Put about a half cup of water in the bottom or the baking dish and cover with foil. Bake for 45 minutes. Remove the top foil and bake an additional 15 minutes or until the squash is fork tender. Serve warm. **Tasty Tip: Cook your quinoa in vegetable broth to give it so much more flavor! !